Gourmet market, store and cooking school to open next year. Chapel Hill, North Carolina-based Southern Season plans to enter the Atlanta market with a location in north Buckhead. The new store will include a full-service restaurant, cooking school, fresh flowers, bakery, deli and cheese departments, along with a large selection of gourmet food items and gifts. Although I have not visited a Southern Season before, the description of the store makes me think it may be a good alternative for those who miss Eatzi's, which closed on Peachtree Road in Buckhead in late 2006. The store also seems to offer some of the same items currently found in nearby Savi Provisions in Tuxedo Festival. Southern Season will be located on Roswell Road and will occupy about 25,000 square feet at Powers Ferry Square shopping center. The space the new store will occupy includes that of the former CVS Pharmacy (about 18,000 square feet), and the current Fox's (about 7,000 square feet). Interestingly enough, the current Fox's was previously a location of Harry's in a Hurry, a local market and prepared foods emporium. A friend who once worked at Fox's indicates that the store opened in 2005. 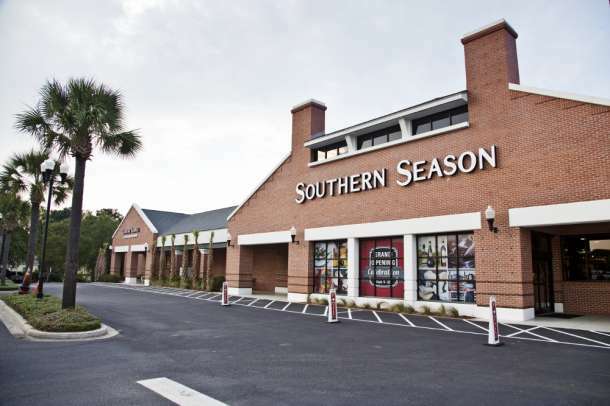 Plans call for the new Southern Season store to open in second quarter 2016. In addition to the Buckhead store, new Southern Season locations are planned for Charlotte, North Carolina, Nashville, Tennessee, Birmingham, Alabama, northern Virginia and Florida. While I have no doubt that Southern Season will be popular, I worry that it may be too popular for an already congested parking lot and area. Given its size, Southern Season will serve as the center's anchor at a time when junior anchors and restaurants already in the center command a considerable amount of the existing parking. For what it's worth, at about 25,000 square feet, the Buckhead location will be the smallest, by far, of existing Southern Season stores. The store will be modeled after the company’s flagship store in Chapel Hill. The Buckhead store will be the chain's fifth overall, all of which are located in the Southeast. Southern Season was created in 1975 by Michael Barefoot as a coffee roastery occupying a mere 800 square feet. In 1978, it was operating primarily as a retail store offering gourmet specialty food items in Chapel Hill. By 2003, it had moved up to a nearly 60,000 square foot space in Chapel Hill's University Mall. As of 2011, Southern Season is majority owned by TC Capital Fund, a joint venture between Carrboro Capital Corporation and Tryon Capital Ventures, LLC, private equity groups local to North Carolina. At the time of the ownership change, the company dropped the "A" that used to precede "Southern Season." “Buckhead is the ideal market for our customers,” said Dave Herman, president of Southern Season. “We have a strong belief and heritage in gourmet food, food education and hospitality and a passion for the art of entertaining with food and wine as the focal point." Interestingly, although the Powers Ferry Square site plan has been updated to reflect Southern Season as its new anchor, Full Cup, a local bakery which sadly closed last week, is still listed as a (current) tenant. Have you been to a Southern Season before? How was it? Are you excited for the opening of Southern Season? Do you think Southern Season will compliment or compete with Savi Provisions and The Fresh Market? Southern Season is an amazing store. So excited that it is coming to Buckhead. Southern Season is an amazing store. I am so excited that it is coming to Buckhead. Love this store --there is one in Charleston, SC and it's SO awesome!!!! Love love love. Very cool, unique store. I am a North Carolina native and LOVE this store, and having lived in the Triangle area at one time shopped there as well. Very exciting for Buckhead and the other coming soon locations as well! Is the market at Savi Provisions open again? The market side closed a year or so ago, which was unfortunate. I think Southern Season could do very well, but you're right, parking's going to be a big problem, especially at that end of the center. Feel like just saying, "ditto," but it's true. This should be a great addition to the area. I loved A Southern Season when I was at UNC. The one in Mt. Pleasant SC is just glorious. I think it's waaaaay better than Eatzi's ever was and I loved Eatzi's, but I'm not sure how it'll survive here if Eatzi's didn't. It's a niche market for sure, but I agree w/ the owners that Buckhead offers just the niche they're looking for. I wonder how thw M.P. store performs. There are always tons of people milling about, but I rarely see people purchasing. Hopefully they do. I just never see it. Where is Party City headed after it leaves Sandy Springs Plaza? I also fell in love with Southern Season when I was at UNC. It will be a great addition. I worked at A Southern Season for 10 years & LOVED IT, although the company vision at the time was that we would never open locations away from home because we didn't think that what "made us who we were" could be executed by non-locals and non decision-makers in remote locations. New ownership means new visions... and I'm looking forward to a taste of home coming to Atlanta.